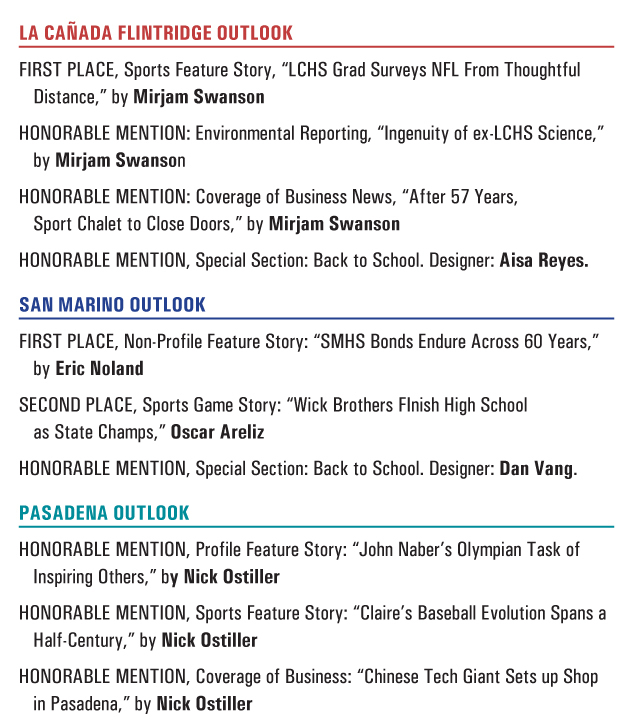 La Cañada Flintridge Outlook newspaper claimed four awards and the Outlook Newspaper group won a total of 10 in the statewide journalism contest conducted by the California Newspaper Publishers Association, it was announced last weekend in Santa Monica. Senior staff writer Mirjam Swanson’s story on Sam Farmer, the L.A. Times’ renowned NFL beat writer (Feb. 4), took first place in the Sports Feature category. When the group of strangers came barging in this week, cameras in tow, the classes they interrupted were in the midst of starting work on a math packet, passionately reciting Shakespeare, studying spelling words. None of the teachers, who had to take a timeout mid-lesson, was expecting the visit.